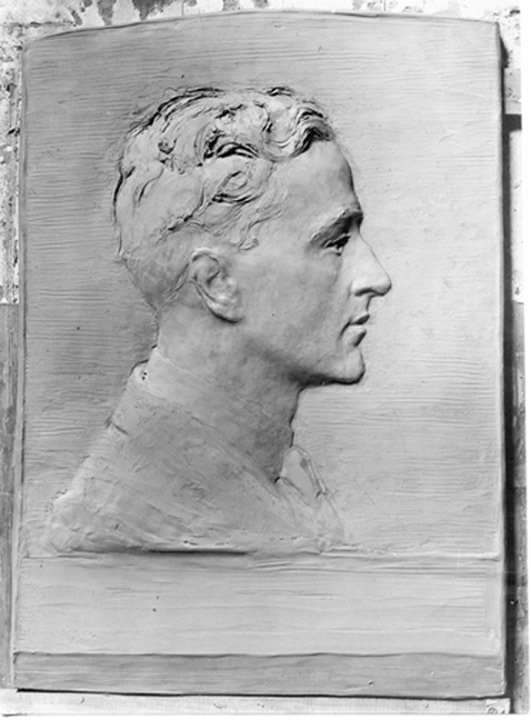 Portrait relief modeled in Paris in 1913 in clay, bronze cast believed to have been made, size unknown but approximately life size, location unknown, unsigned. Photograph taken in Paris in 1913, identified on back side with Storrs name, date and photographer. A death mask of Storr’s mother was taken in Paris in 1913 by Allen, location unknown. John Bradley Storrs and Frederick Warren Allen met first as students of Bela Lyon Pratt at the School of the Museum of Fine Arts in Boston in 1909-1910. Allen came to the Museum School on the recommendation of his sculpture instructor William W. Manatt, a student of St. Gaudens, at the Rhode Island School of Design. Under his influence, Allen decided that he wanted to be a sculptor. Manatt wrote a letter recommending him for a scholarship at SMFA. 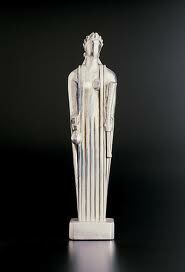 With that financial award, he started classes in 1909, the same year that Storrs entered the sculpture class. Storrs came to the SMFA from the Art Institute in Chicago where he had studied sculpture for four months under Laredo Taft, a sculptor trained in the academic arts at l’École des Beaux-Arts in Paris. Chicago was Storrs’ home city; his father was a well-known architect and real estate developer there. Motivated to find a more modern idiom for his work, John moved on to Boston. He stayed for a full year at the Museum School, but found studying with the St. Gaudens-trained Pratt too confining. Restlessly searching for an esthetic foundation that pleased him, he traveled to Philadelphia, to the Pennsylvania Academy of Fine Arts where he studied for less than a year under Charles Grafly, yet another classically-trained sculptor. The academic style was clearly not right for him. Retreating into the classics was almost offensive to Storrs. In his journal he writes, “the greek faced libraries are filled with ancient literature-‘Art’ (?) is stored away in museums-kept on ice as it were-They teach them how to work but not how to play-how to spell but very little about life.” (reference from p.15 in Balken) He moved on, this time to Paris in 1911, expecting to find modern art there, but again he found himself disappointed. Then he met Auguste Rodin, the most innovative sculptor in Paris at the time, and became his favored student and assistant from 1912 through 1913. It was in Paris in 1913 that Allen and Storrs met again. Both studied at the Académie Colarossi with Paul Wayland Bartlett. * They lived about 20 minutes apart, Allen in the Latin Quarter at 100 Rue d’Assas and Storrs closer to Rodin’s studio at 9 Avenue Daniel Lesueur . The Left Bank was the most popular place for student apartments with museums close by including the Luxembourg Museum where they could observe and draw from the modern artists exhibiting there. The rich culture of the area, the ateliers and academies for study, and the collection of fine art available for free viewing, all provided an important expansive experience for the American artists. Paris academic study was based on the figure and sculpture was no exception. Disciplined classes emphasized drawing and sculpting from classical examples; working from the live model formed the base of their training. Rodin was a master of the figure and innovative in his approach to it, but in his teaching, he encouraged his students to find their own artistic expression. Storrs responded to that encouragement and experimented with the more modern styles, finding inspiration from the cubists and working in a way that developed into a more planar, geometric, architectural mode, uniquely his own. Ceres, 1928 by John Bradley Storrs, standing at the top of the Chicago Board of Trade Building, combines his figurative sculpture training with his interest in geometric forms and architecture. It may have been that mask that Storrs used in sculpting his mother’s portrait bust in 1913 from the luminescent white marble that Rodin favored, a beautiful and emotional image emerging from an unfinished block of stone. Allen’s bas-relief of Storrs was modeled in Paris in 1913 according to the inscription written on the back side of the photograph. The clay relief pictured is not signed and appears to be incomplete, perhaps because of the death of mother Storrs. The style is like St. Gaudens, a cameo-like profile on a textured ground in a simple arch-topped frame border. The shoulders sit on a base, which would, if it had been finished, most likely have contained lettering displaying identifying information and symbols of Storr’s profession. The rich tooling in the details of the hair and facial features balance texturally with the smooth skin of the face and neck. The face is expressive and sensitively modeled. The jacket, shirt and tie are impressionistic rather than realistic in their details and subordinate to the accuracy of the face of the man portrayed. It can be assumed that Storrs sat live for the portrait, as no images in this pose are known to be available from which he might have worked. 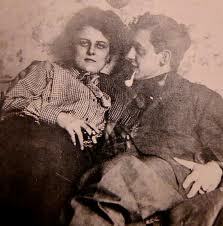 In 1914, Storrs married a French writer, Marguerite Deville Chabrol, and settled down in France, traveling to America for exhibitions and visits with his father. He was twice interned during the war, which broke his spirit and left him without materials and tools for sculpture. During this time he turned to painting and drawing. His sculpture moved from representational to cubist to art deco to the architectonic and machine-age modern for which he became famous, perhaps a nod to his architect father. France became his permanent residence. He worked and lived at his studio and home in Mer, France until he died in 1956. Storrs was a doggedly independent spirit, keenly introspective, and compelled to find a modern expression for his work. He learned from excellent teachers, experimented widely and through his innovations formed a bridge between classical and modern sculpture. After all, he wasn’t interested in expressing emotion; for Storrs, it was all about volume and form. *Paul Wayland Bartlett was also a student of Rodin, but classically trained and known for his pediment on the House of Representatives in Washington, D.C. He was accomplished in the lost wax method of bronze casting and an innovator in the art of applying patinas. Sculpting animals, insects, reptiles and fish was another remarkable talent for which he was known. Allen, Agnes H., “Frederick Warren Allen, 1888-1961, Sculptor, Teacher, Member National Sculpture Society,” a biography written for her grandchildren. Wikipedia, the free encyclopedia on John Storrs, references listed.